The flower arrangement that you make for the funeral is much more than important than you think. First of all, when saying your goodbyes to the departed individual, you need to make sure that you create a beautiful atmosphere for the sake of the deceased soul. Moreover, the type flower arrangement you use can say a lot of about the relationship you had with the individual. Thus, it is important for you to be aware of the main types of flower arrangements that can be made. The following are some such flower arrangements that you can take into consideration. These are flower arrangements that are directly placed inside the casket. If you want to make sure that your flowers will stay closely with the departed individual, then this is the type that you must purchase. Casket adornments include a variety of items such as small bouquets, garlands, mini-wreaths and strands of blossom. Since these flowers touch the body of the deceased, you need to make sure that they are small and soft. These are yet another type of flower arrangements that you can consider when you are doing the funeral service. If you think that standard vase bouquets are too small, then you should go for this option. Although the flowers are kept in a vase, you can be assured that they will not go unnoticed. Apart from choosing any flower you want, you also get to choose any style of vases or baskets that will suit the atmosphere. Since these flowers are kept on the floor, you need to make sure that they will not kept knocked off or trampled. If you want to enhance the aesthetic appeal of the funeral home, then standing wreaths will do the job. They are not only beautiful for the eye, but they are quite elegant too. One of the biggest advantages of this type of flower arrangement is the fact that you can move it anywhere you want without any hassle. This is due to the fact that the arrangement is located on top of a tripod stand. Thus, you will be able to arrange the flowers in any design you want. These are a type of arrangement that are usually kept on top of the casket. Since the flower arrangement is above the casket, you need to make sure that you purchase truly beautiful flowers. If you are opting for an open casket, then the arrangement can be kept on the bottom half of the coffin, which is also known as the closed half. 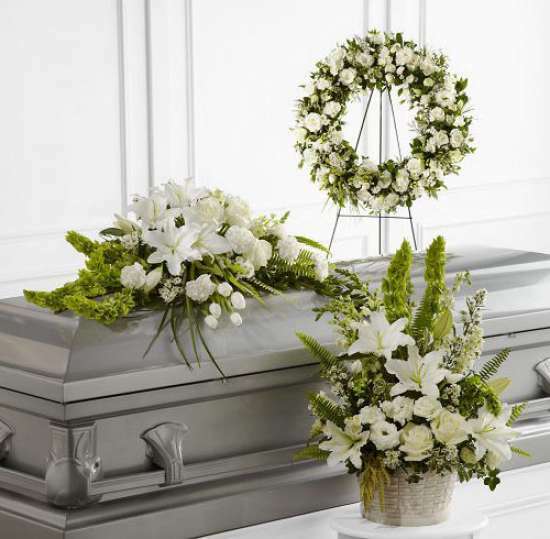 On the other hand, if you are using a closed-casket, the arrangement will have to be much larger since you can use the entire top of the casket. When you make your decision out of these options, you must not just pick the type that is visually appealing since it is important to choose a type of flower arrangement that will suit your budget as well.